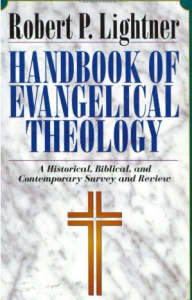 This is a recent book (1995) by Lightner, long time professor of systematic theology at Dallas Seminary. It is a progression through the major areas of theology, each including a historical perspective, a positive statement of the doctrine and an update on areas where today’s Christians differ. It is very helpful in presenting the latest expressions and variations of our historical doctrines. It also has some new and nicely done charts and graphs. One, for example, plots the various works of the Holy Spirit as they have been operative in different ages. There is a series of line-charts defining the various millennial and rapture views. I also appreciate Lightner giving his own view on the doctrines he discusses. This would be a good book for a bible study of basic doctrine, whether in an organized class, a one on one or small group study, or just for a self-study to refresh and update. Lightner definitely identifies himself as a premillennial, dispensational pretribulationalist (p. 258). The book is only about 280 pages of text. It has a complete name index, subject index and scripture index.